Photo Courtesy info : Tibetan Mastiff Rescue, Inc. 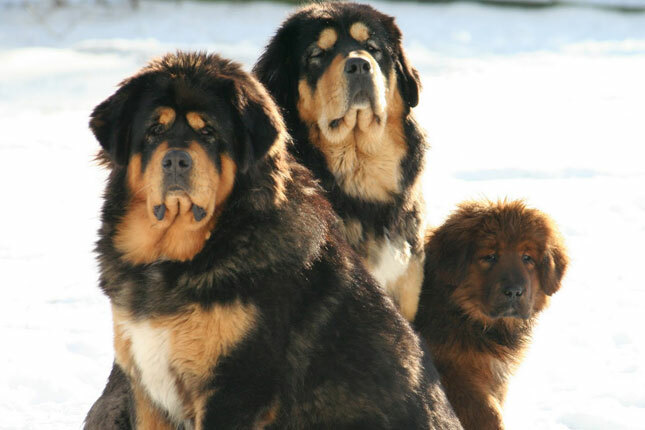 The Tibetan Mastiff is descended from the famous Tibetan dogs that were the source of the majority of Molossers and Mastiffs throughout the world. The ancient Tibetan Mastiff may have been in existence as early as 1100 BC. They were often left behind to guard the families and tents when the men left to move the flocks to higher pasture. It was not until Queen Victoria of England was given one of these dogs in the mid-1800s that they came out of isolation. It was not long before more dogs were imported to England. The British wrote up a standard and began to breed them. Marco Polo described the Tibetan Mastiff as "tall as a donkey with a voice as powerful as that of a lion." Tibetan Mastiffs were imported from India, Nepal, Ladakh and Afghanistan to the United States in the 1970s and were used as foundation stock for the breed. Now rare in Tibet, the Tibetan Mastiff is gaining popularity in both the United States and England. The American Tibetan Mastiff Association was formed in 1974 and serves as the breed's official registry and network in the United States. The Tibetan Mastiff is courageous, fearless, even-tempered, calm and thoughtful. Very loyal to its own family. Tends to bark at night if left outside, but will be quiet indoors. It is an outstanding flock guardian and is ferocious against wolves, leopards or any prey that try to approach its flock. This is a breed that is easy to housebreak, but matures later in life than the average breed. The Tibetan Mastiff needs a firm, confident, consistent pack leader to prevent it from becoming willful and stubborn, overprotective and territorial. These dogs have a strong desire to please their owners. They are loving with children, but can distrust and be reserved with strangers if not properly socialized. It comes naturally to this Mastiff to guard its family and their property. It has to be raised to adulthood in a careful, well-balanced manner. A stable, well-adjusted and trained dog is for the most part generally good with non-canine pets. It is possible for them to get along with other dogs if the owners are able to communicate with them that fighting is an unwanted behavior. Tibetan Mastiffs will not listen if they sense that they are stronger minded than their owners. Owners need to possess a natural air of authority to their demeanor. The objective in training this dog is to achieve pack leader status. It is a natural instinct for a dog to have an order in its pack. When we humans live with dogs, we become their pack. The entire pack cooperates under a single leader. Lines are clearly defined and rules are set. Because a dog communicates his displeasure with growling and eventually biting, all other humans MUST be higher up in the order than the dog. Tibetan Mastiff owners must be the ones making the decisions, not the dogs. That is the only way your relationship with your dog can be a complete success. When owners make it absolutely clear they are alpha over the dog in a calm, but very firm manner, and the dog is well exercised, trained and socialized, it can be a very good family companion. This breed requires an experienced owner. The Tibetan Mastiff needs to be taken on daily walks. While out on the walk the dog must be made to heel beside or behind the person holding the lead, as in a dog's mind the leader leads the way, and that leader needs to be the human. Be careful that the bones, muscles and joints of the young dog are not overworked during the growing stage by not overdoing the physical side of its life. However, they will still need to walk each day to satisfy their migration instinct.